SSI, Server Side Includes, can be very useful to webmasters and visitors alike. They are easily set up in an .htaccess file and require little to no maintaining.. the term "Set it and Forget it" applies here. Before we look at how to implement SSI, and dig into the Apache module that makes them possible, lets look at few uses for SSI so you can quickly determine if you would like to read further. One way that I use SSI is for improved Directory Listing. Anyone here like SEO? Check out my WordPress uploads directory to get an idea. Basically I can customize the header and footer of each directory.. Pretty sweet, thanks Apache! 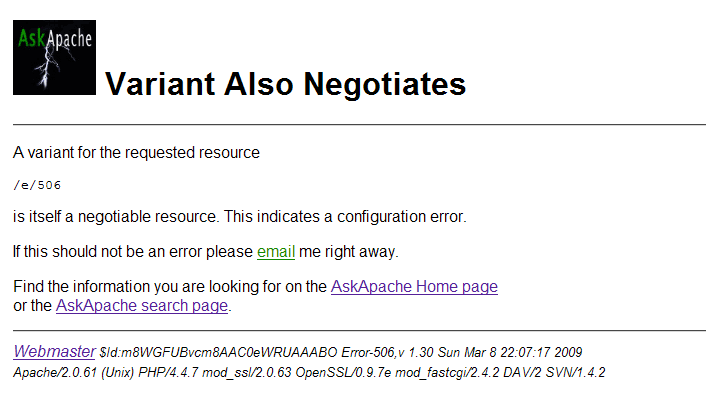 If you are using WordPress, I'm sure you are using my AskApache Google 404 Plugin, but whatever your error pages may be, using SSI you can make them better. My 404 Error Page is handled by WordPress and PHP, but all of my other error pages (codes 4xx to 5xx) are handled using SSI. You can check out any of them: /show-error-400, /show-error-403, /show-error-503, etc..
Notice the email note which has the subject prefilled? Thats one of the main uses for SSI, you can add forms to your errordocuments and get notified of problems which mean you can fix them. Add this to your /.htaccess for each ErrorDocument you make. Say you are using some nice .htaccess rewrite rules to block offending bots, web scrapers, and other nefarious net characters. Instead of just sending a 403 Denied, you could send them to be handled by an SSI document that could do any number of things.. From adding the offending bot's IP address to the .htaccess Deny List (blacklisting), emailing you with an alert, emailing the IP Block Owner, executing a denial-of-service response ala guardian (script will return an artificially high Content-Length, and will then spoon-feed content bytes back to the client at a rate of one byte per second, for single-threaded or fixed-threadpool clients, this will hang all of their requests and render the attack inoperable), or just output a frightening looking message which usually does the trick if the bot is humanoid. Ok now that we have the real-world usage out of the way, lets dig in a bit to the actual module mod_include, which if you want you can view the source code here. These are the Directives allowed in .htaccess files that are handled by mod_include. Note that other modules may add additional directives, for instance the exec SSI Directive is supplied by mod_cgi. This is how mod_cgi registers with mod_include to provide processing of the exec directive. This is the code required to handle the "exec" SSI directive. Controls various aspects of the parsing. (since 2.1) The value is a message that is sent back to the client if the <a href="#element.echo">echo</a> element attempts to echo an undefined variable. This overrides any <a href="#ssiundefinedecho">SSIUndefinedEcho</a> directives. The value is a message that is sent back to the client if an error occurs while parsing the document. This overrides any <a href="#ssierrormsg">SSIErrorMsg</a> directives. Prints one of the include variables. If the variable is unset, the result is determined by the SSIUndefinedEcho directive. Specifies how Apache should encode special characters contained in the variable before outputting them. If set to none, no encoding will be done. If set to url, then URL encoding (also known as %-encoding; this is appropriate for use within URLs in links, etc.) will be performed. The default is set to entity, resulting in entity encoding. Set a value of a variable. Prints the last modification date of the specified file, subject to the timefmt format specification. Prints the size of the specified file, subject to the sizefmt format specification. Used to put text into the output stream if the original test_condition was false. Ends the if element and is required. <!--# - The starting tag for mod_include to recognize and parse as SSI. --> - The ending tag for mod_include to recognize and parse as SSI. [an error occurred while processing this directive] - On Errors parsing SSI. (none) - When echoing an undefined variable.